Finely slice cabbage and place in a large bowl. In a small bowl, mix together mayo, Sriracha, lime juice and salt. Add dressing to cabbage and mix thoroughly. Place slaw in the fridge to chill. Heat 3 inches of canola oil in a Dutch oven (or deep saucepan) to 350°. Prepare three separate bowls, 1 with flour, another with eggs and one with combined panko, breadcrumbs, garlic powder and cayenne. Working in batches, dredge cauliflower in the flour, then the eggs and lastly the breadcrumbs, coating completely. Working in batches, fry cauliflower for 2 to 3 minutes, until crispy and golden brown. Place fried cauliflower on a rack in the oven to keep warm. Heat a pan over medium and warm tortillas. Mix sour cream and lime juice together. 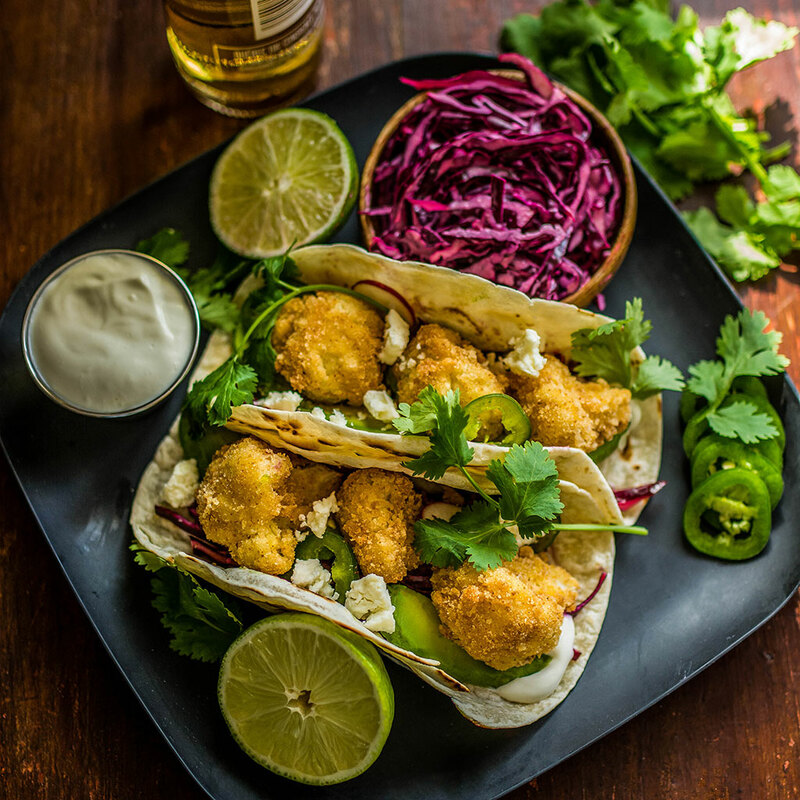 To serve, fill toasted tortillas with 1 tablespoon of lime, sour cream, a good handful of slaw and three or four cauliflower pieces. Top with a crumble of feta cheese, one sprig of cilantro and a few slices of jalapeño.